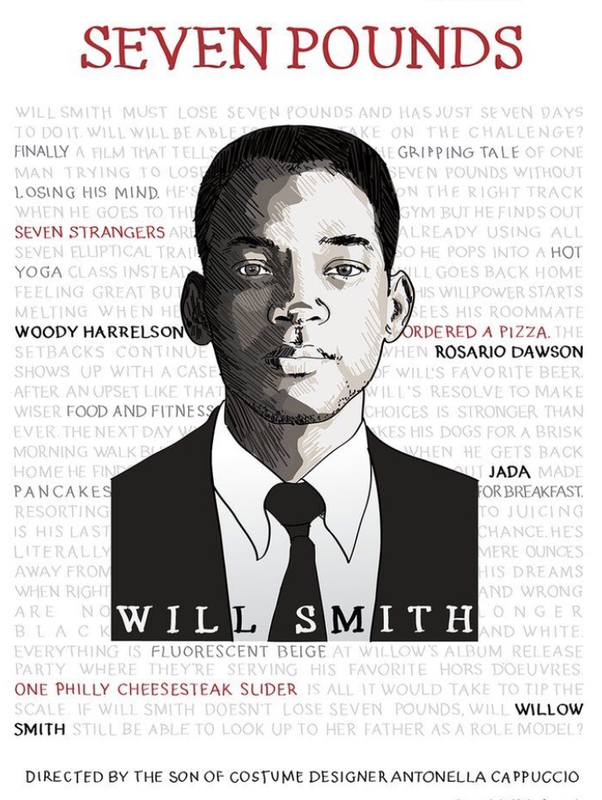 Seven Pounds (Reviewish) – Jonez, Where We Going? Please do not EVER let me watch the movie, ‘Seven Pounds’! Ever! The credits have finished rolling and I can not stop the tears from falling. I wonder If I could do it, IF I could give up my life to save someone else’s. Not just someone else, a stranger. A total stranger, someone who I had no prior knowledge of their life, only by watching them in the now, being able to figure out what type of person they are. Knowing you are the key to help, but by helping them, you were killing yourself. I understand why the main character Ben Thomas (Will Smith) felt like he needed to repay what was lost to possibly restore balance in the Universe. Especially since he felt wholly responsible for the accident that claimed the lives of seven beings. Although I understand, I do think he could have repaid the Universe by being an amazing man, helping in all aspects that he could. He was an engineer, that was formally trained at M.I.T. so the ways in which he could repay the Universe back was endless. In a way I do believe him taking his life, although, for a commendable reason was slightly selfish. With Ben committing suicide he no longer had to deal with the emotions stemming from the accident, he no longer had to deal with anything. What if the accident happened as a part of God’s (Whoever you believe in) plan? What if the lives lost, were due to a greater reason, a greater plan that Ben just wasn’t privy to? The movie leaves me with more questions than answers, however If I have to watch the movie again to get the answers, well then I’ll never have them. Cuz Im not ever going to watch that movie again. Twice was more than enough.